This homemade gluten free oreo cookie recipe is so fun to make. Just choose your filling and have fun! You can also use any shape cookie cutter to make these cookies. Can you believe I have never made a gluten free sandwich cookie? I have made whoopie pies, and things more cake-like, but never a real filled cookie that resembles an oreo. I buy those chalky gluten free oreo substitutes at Trader Joe’s, but unless I use them smooshed as a crust, I don’t like them. It was definitely time to change that when I found this green frosting on sale. 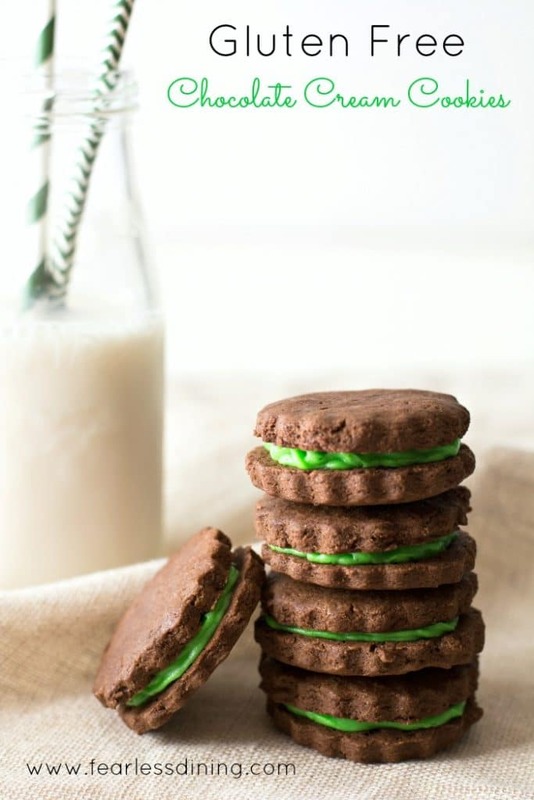 It seemed a little early for green to be on sale with St. Patrick’s Day coming, but I thought it would look pretty in these gluten free chocolate cookies. My kids were pretty excited about this gluten free cookie recipe too. These cookies are not crispy like an oreo, they are a bit softer, more like a sugar cookie. Both kids said they were delicious, and next time make them with Nutella inside :-). We hope you love this gluten free chocolate cookie recipe as much as we do!! Want to see our favorite gluten free cookies on this blog? There are a LOT :-). Sorry, it is hard not to taste when I am taking pictures :-). These cookies are really easy to make. You will find that my cookie recipe resembles any gluten free sugar cookie recipe. Once I have the batter all mixed, I rolled it out really thin. 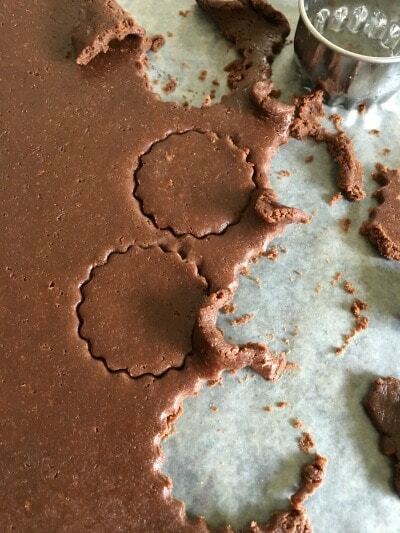 Use a small cookie cutter to cut out the cookies. In hindsight, I shouldn’t have used this cutter with the scalloped edges. It was a little harder to peel the shapes out once cut. You can use any shape cutter you like. Just make sure your dough is cold. Cookie cutters…these have so many fun uses. An easy to use and easy to wash rolling pin. 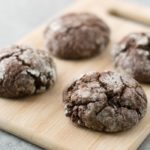 Easy gluten free chocolate cookies that work perfectly to make sandwich cookies. In a large mixer, add all wet ingredients and mix. Add in the dry ingredients slowly. Remove the dough and wrap in plastic wrap. Remove the dough from the refrigerator and remove from the plastic wrap. Place the dough on a piece of wax paper. Cover with another piece of wax paper and roll to 1/4 inch thickness with a rolling pin. Use your favorite cookie cutter to cut out shapes. Spray coconut oil on a baking sheet. Place each cookie shape on the baking sheet. Bake the cookie shapes for 8-10 minutes. Remove from the baking sheet and place on a cooling rack. Allow to cool then use frosting to fill. More Yummy Recipes to Try! 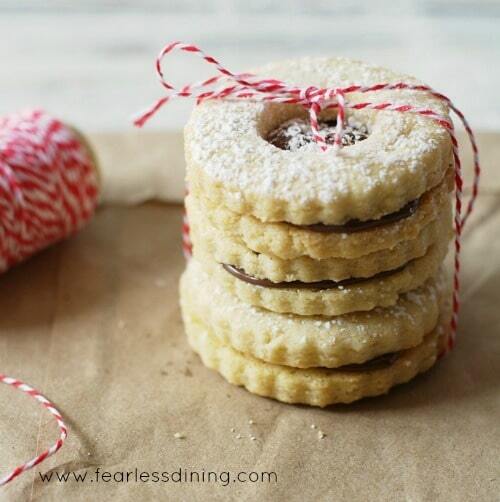 If you haven’t tried a linzer cookie, give these Nutella stuffed gluten free linzer cookies a try! I would love to have a few of these right now. They look superb! I love the color combination with the brown and green. They’re so pretty. Did you make the filling mint flavored? Thank you Renee. I actually found a Wilton green frosting that was on sale. Any frosting, or even Nutella would be amazing in these cookies. How cute! These sound so amazing. I love that shade of green… Perfect for St. Patrick’s Day! These look amazing and how cute for St Patty’s day! These look so much better than any store bought cookie could ever be! Plus I like the festive green filling! Thank you Erin…my kids didn’t complain about the green LOL.